Michael Jecks: Photo Diary » Blog Archive » ‘Mad Mark” Bazeley. ‘Mad Mark" Bazeley., originally uploaded by michael_jecks. Second piece about London to Brighton. But, thank Goodness, I took a short six mile ride with â€œMad Markâ€ Bazeley after Cornwall, and then another eighteen miler the week after, and the ankle seemed to hold up OK. Even though a chunk was coming up from Spreyton to Hittisleigh, which I can promise you, is a ruddy silly hill that no sensible person would ever consider riding up. I had made the tactical error of having a good lunch that day, and nearly saw it return several times up that blasted hill. Still, in the end I managed to make it to London, and although the drive up seemed to exacerbate the problems, on Sunday it looked and felt OK. We set off happily, and were at the start in plenty of time. « Injured Morrisman with dogs. 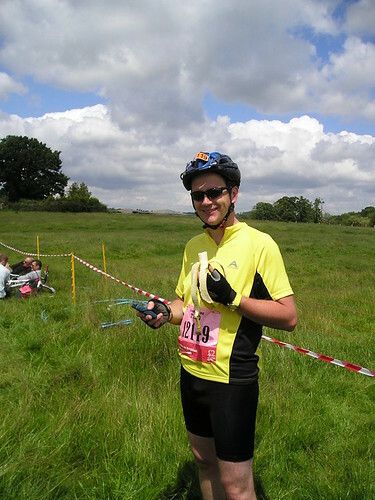 This entry was posted on Tuesday, June 19th, 2007 at 3:09 pm	and is filed under Bike ride, Dartmoor. You can follow any responses to this entry through the RSS 2.0 feed. You can skip to the end and leave a response. Pinging is currently not allowed.